Hiding 'Last seen' notification in WhatsApp is not any trick, it can be simply done by anybody by making little changes in your WhatsApp account. As we know WhatsApp is #1 social networking site in today's time. Approximate there are 10 billion people who are using WhatsApp worldwide, because their low data charges and features like sending images, audios, videos in minutes over mobiles. But there is a feature from Whatsapp which shows the other contacts of WhatsApp that when we last seen or online on WhatsApp. But sometimes when we are not able to chat or reply but just on WhatsApp for reading messages, then it shows other contacts that we are online or later shows in form of last seen time in notification and this thing irritates sometimes and let other contacts to know about our online timings. That's why we want to avoid this. Don't worry you can do it now, just keep reading this post till end. So after Writing on Funny Whatsapp dares, I decide to write on this topic also. After reading this post, you will be able to hide your last seen status notification from your friends without doing much effort. As I already told you, it's not any trick. To make it 'ON' you have to just follow some basic steps which are given below step by step. #Go to 'Settings' option in Whatsapp. #It will show you a dialogue box with options shown in image. 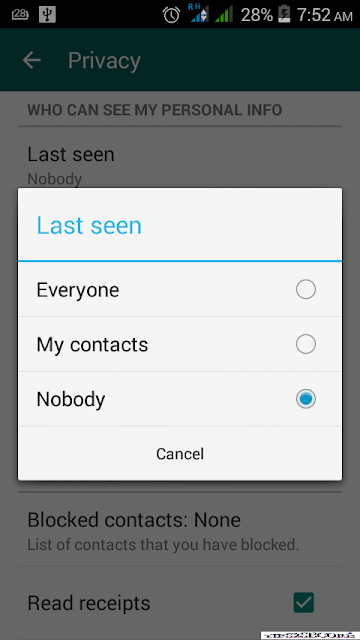 #Select last seen to 'Nobody'. If you face any problem in doing these steps then please let me know, I will provide step by step solution with screenshots. I came to know about this last year, but I never used this option because if we do this then we are also not able to see others last seen notification. Few days ago I also try this, I also like it but after two days again I reset my changes. But it may be beneficial for you, if you really want to hide your 'Last Seen' notification from Whatsapp. Message : I hope that you have enjoyed 'How to Hide Last Seen Notification in Whatsapp' article. However, if you want me to deliver more articles then please share my post. You can use Social Sharing Widget provided at the end of every post. After all, Sharing is Caring!